The Guide to Modern Employee Recognition Why is Employee Recognition Important? Disengaged employees cost businesses an estimated $550 billion dollars last year in the United States alone. Organizations across the world see the need to improve engagement, but there is little consensus on which methods and strategies are most effective. In their attempt to overcome poor employee engagement, many organizations expend resources on tools and strategies that fail to make an impact on the source of the issue. Funding ineffective solutions simply compounds the losses associated with disengaged employees. Staff recognition is a highly effective and proven strategy for improving employee engagement. A well-implemented staff appreciation program has the power to impact many aspects of business from morale, to productivity, engagement, and even retention. A non-existent, poorly-designed, or poorly-implemented employee recognition program can have the opposite effect, decreasing motivation, and even pushing good employees away. Employee turnover is an extraordinarily costly business expense that is often underestimated and underrepresented. It's possible to calculate many static elements of employee turnover's cost, but there are such a vast number of cost variables associated with employee turnover, the cost is almost always larger than expected. You can use our cost of employee turnover calculator to establish a cost baseline, but it's important to remember that like an iceberg, much of the cost associated with turnover is hidden. Employees whose work is recognized and appreciated are more likely to stick around. Frequent staff recognition often improves productivity. It's really fairly simple math: you do some great work, you're recognized and rewarded for that great work, you're incentivized and motivated to do more great work. The benefits don't stop there. Recognizing great work can help teams produce work at a higher level. Frequent recognition supplies employees with the constructive feedback they need in order to know which of their efforts are most appreciated. Armed with that information, they're able to direct their newly-inspired motivation toward work that will make the greatest possible impact on their organization. Employee morale is a crucial element of any operation. With low morale, nearly every aspect of an employee's contributions will suffer. High morale, on the other hand, tends to inspire greater productivity, creativity, and overall satisfaction. Showing appreciation for an employee's valuable contributions is a great way to boost morale. This employee morale boosting effect is intensified in a group setting. Building a culture and environment based on employee appreciation improves each of these important areas, but it's crucial to understand how the foundation fits together before starting to build the rest. Recognizing employee performance increases engagement by almost 60%. Companies with a recognition-rich culture had 31% lower turnover. 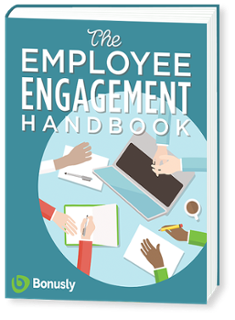 Download your free copy of the Employee Engagement Handbook.